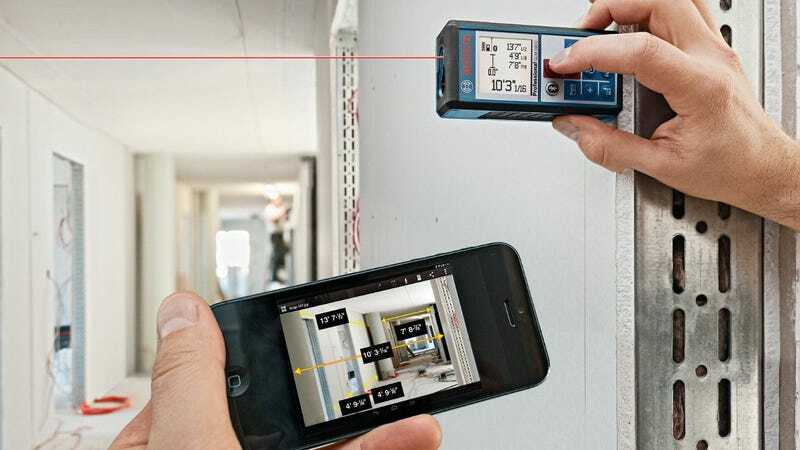 Sure, that laser rangefinder made short work of measuring every dimension in that room you plan to renovate. It's just too bad you jotted all those measurements down on the back of an old receipt that promptly went missing. That's why Bosch has given its new GLM 100 C laser rangefinder Bluetooth capabilities and an accompanying app so every last measurement is accurately documented. The rangefinder itself can measure distances up to 330 feet with an accuracy of 1/16-inch, so while it might not quite be right for precise carpentry, it's the perfect tool for determining how many square feet of carpeting or drywall you'll need for a room. The rangefinder can also automatically calculate area and volume as long as you feed it multiple measurements, and every last bit of data it collects can be synced to the GLM measure&document app and even used to annotate photos of a given space.